Burlington Mayor Miro Weinberger unveiled on Tuesday a “unity campaign” of city councilors — along with former mayor Peter Clavelle — who are urging residents to vote “yes” on four city ballot items. 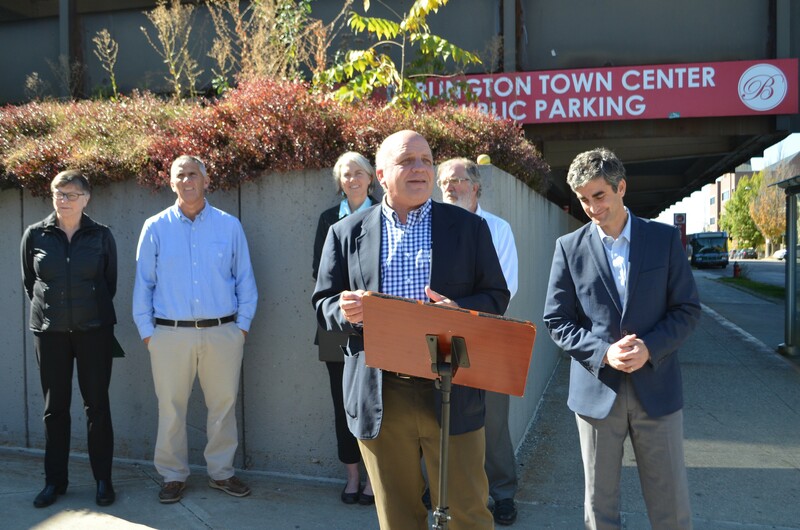 While ostensibly about all four local issues on the November 8 ballot, the news conference — held along Cherry Street in the shadow of the Burlington Town Center mall — focused mainly on the two most controversial items: a downtown zoning change that would allow the mall redevelopment to go forward and $21.8 million in tax-increment financing for street and infrastructure improvements around the proposed development. Weinberger pitched the coalition as a broad representation of city districts and political parties. Among its members: Progressive Burlington City Council President Jane Knodell; Independent Councilor Dave Hartnett; Democratic Councilor Joan Shannon; and Clavelle, a former Progressive mayor whose most recent term ended in 2005. Councilor Tom Ayres, a Democrat, isn’t officially a member of the group but showed up in support, he said. Meanwhile, members of the outspoken Coalition for a Livable City, which is against the redevelopment plan, watched the sidewalk gathering and handed out literature urging passersby to vote “no” on the zoning change and TIF proposal. The livable-city group has been a constant presence at city meetings and at other events speaking out against the $250 million redevelopment proposal, which includes mixed-use buildings of up to 14 stories tall. They ran a full-page advertisement in Seven Days against the proposals. Weinberger and the councilors said they encourage debate about the issues but accused the group of misleading Queen City residents. “Claims about the TIF diverting money from Burlington schools, that existing zoning would give you more affordable housing and that we would get a better development without this zoning change are factually incorrect,” Shannon said. Clavelle, who served as mayor from 1989 to 1993 and again from 1995 until 2005, called the current mall a “dinosaur” and championed the redevelopment as an important chance to make over downtown. “Jobs will be created, housing will be provided, the tax base will be expanded, and it will position Burlington to remain the cultural, the economic, the educational center of this region,” he said. Also on this year’s ballot is an $8.4 million bond — which needs a simple majority to pass — to replace aging water pipes, along with a separate $27.5 million bond for other capital improvements, like street and sidewalk repairs. The latter bond needs two-thirds of the city’s residents to vote ‘yes’ to pass. All four councilors in the unity campaign were among the eight who voted to put the zoning change to the voters on November 8. The TIF proposal received only one “no” vote, from Councilor Max Tracy, a Progressive who is also against the zoning change. The group is raising money through the Partnership for Burlington’s Future, a political action committee Weinberger created in 2012 to advocate for local ballot questions. With Election Day just a month away, the group plans in the coming days and weeks to hold town hall meetings with the mayor, house parties across the city and a “telephone town meeting” the Sunday before November 8 during which Weinberger will dial up all the landline numbers in the city simultaneously. Residents can opt to participate, as if they were on a giant conference call.